1The LDS church typically places very high importance on families and traditional gender roles. 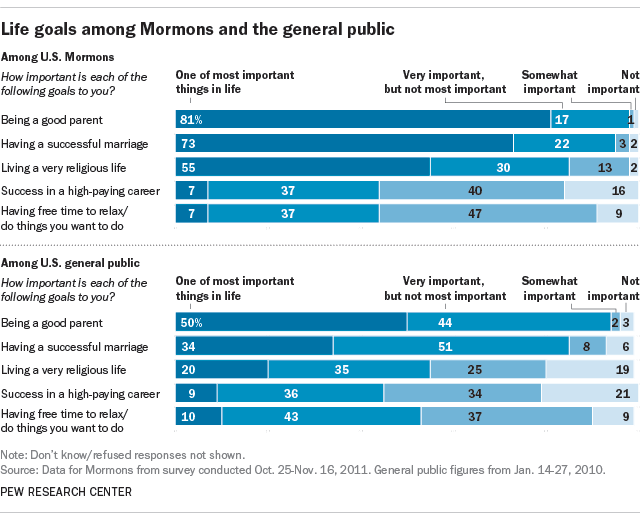 Indeed, 81% of Mormons say being a good parent is one of the most important things in life. And 73% say the same about having a successful marriage. By comparison, half of all U.S. adults say being a good parent is one of the most important things in life, and only one-third say having a successful marriage is of utmost importance. Additionally, 58% of Mormons say a marriage where the husband provides and the wife stays at home is preferable to one in which both spouses have jobs. Among the general public, most people (62%) express the opposite view, saying a marriage in which both spouses have jobs and take responsibility for housework and child rearing is more satisfying. At this fall’s pre-conference session specifically for Mormon women, participants were urged to defend the church’s teachings on marriage, family and sexuality. 3Among all Christian religious traditions in the U.S., Mormons are among the most highly involved in their congregations (67%), according to an analysis based on three measures of congregational involvement: membership in a congregation, frequency of attendance at worship services and frequency of attendance at small group religious activities. 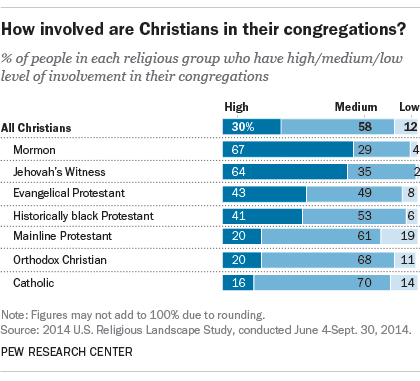 Jehovah’s Witnesses have comparable levels of highly involved members (64%), while evangelical Protestants (43%), members of historically black Protestant denominations (41%) and those in other Christian groups have lower average levels of congregational involvement. In addition, our Religious Landscape Study found that Mormons are among the groups most likely to believe the Bible is the word of God (91%), pray daily (85%), say religion is very important in their lives (84%) and read scripture regularly (77%). 4A number of tenets central to the teachings of the LDS church and widely held by Mormons are not shared by other Christian traditions, our 2011 survey found. Nine-in-ten Mormons believe that the president of the LDS church is a prophet of God (94%) and that the Book of Mormon was written by ancient prophets (91%). Large majorities of Mormons believe that families can be bound together eternally in temple ceremonies (95%) and that God the Father and Jesus Christ are separate, physical beings (94%). 5Mormons are among the most politically and socially conservative religious groups in the U.S. For example, two-thirds of Mormons say they oppose allowing gay and lesbian couples to marry legally, and seven-in-ten say they think abortion should be illegal in all or most cases, according to the 2014 U.S. Religious Landscape Study. And most Mormons (69% in 2016) identify with or lean toward the Republican Party, though the share who do so has edged downward in recent years. 6Mormons are relatively young and less diverse when compared with other Christian groups, and they are younger than the U.S. population as a whole. The median age of U.S. Mormons is 43, while the median age of the general population is 46. As a religious group, they also are much less racially and ethnically diverse than the U.S. population as a whole, with fully 85% of U.S. Mormons identifying as non-Hispanic white.